For the second-straight year, a Missouri defensive lineman will take home the SEC Defensive Player of the Year award. Missouri defensive end Shane Ray took advantage of his first year as a starter, leading the SEC with 14 sacks and 21 tackles for loss. Ray follows in former Missouri defensive end Michael Sam’s shoes after Sam won the SEC Defensive Player of the Year award in 2013. This is the second time a team has won back-to-back defensive player of the year awards, the other instance being LSU in 2010 and 2011. ATLANTA — There was tension in the Georgia Dome with a little less than five minutes to play in the third quarter of the Southeastern Conference Championship between Missouri and Alabama. Despite losing defensive end Shane Ray to an ejection in the second quarter, and despite its defense allowing three first-half touchdowns, Missouri managed to whittle Alabama’s lead down to eight points with 4:37 to play in the third period when kicker Andrew Baggett’s 33-yard field goal made it 21-13. Scores of Alabama fans returned to their seats, their “Roll Tide” chants ceasing for the first time all game. The pocket of gold among the sea of crimson seemed to come alive, finally having something to cheer for. Missouri had fought back from a 21-3 deficit to make it a one-possession game, and maybe it could take down mighty Alabama. As it turned out the tension was fleeting. Alabama responded with a pair of touchdown drives that combined to cover 154 yards on 18 plays and rolled to a 42-13 victory over No. 14 Missouri (10-3, 7-2). For the third time in five weeks, Missouri defensive end Shane Ray has earned Southeastern Conference Defensive Lineman of the Week honors. This time around Ray was rewarded for his two-sack, one pass-break-up effort in Missouri’s 20-10 victory over Kentucky on Saturday. Both of Ray’s sacks came on fourth down to turn possession over to the Tigers. 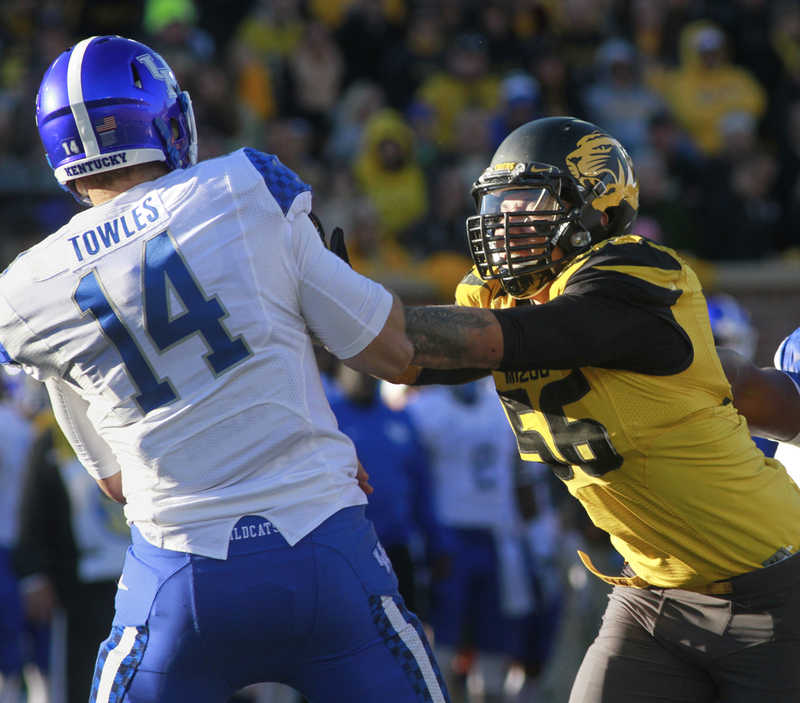 His last takedown of Kentucky quarterback Patrick Towles in the waning moments of the game gave Ray Missouri’s single season sack record. The senior out from Kansas City has 12 sacks on the year and with four or potentially five games to go, Ray could add to his lead over former greats Michael Sam and Aldon Smith, who held the previous record of 11.5 sacks. Saturday marked the fifth two-sack game of the season for Ray, who leads the SEC in both sacks (12) and tackles for loss (16). Nationally, he ranks second and third in those respective categories. Ray was also named one of 20 semifinalists for the 20th Chuck Benarik Award earlier in the day. The award is presented to the most outstanding defensive player in college football, as judged by the Maxwell Football Club. No Missouri player has ever won the award. 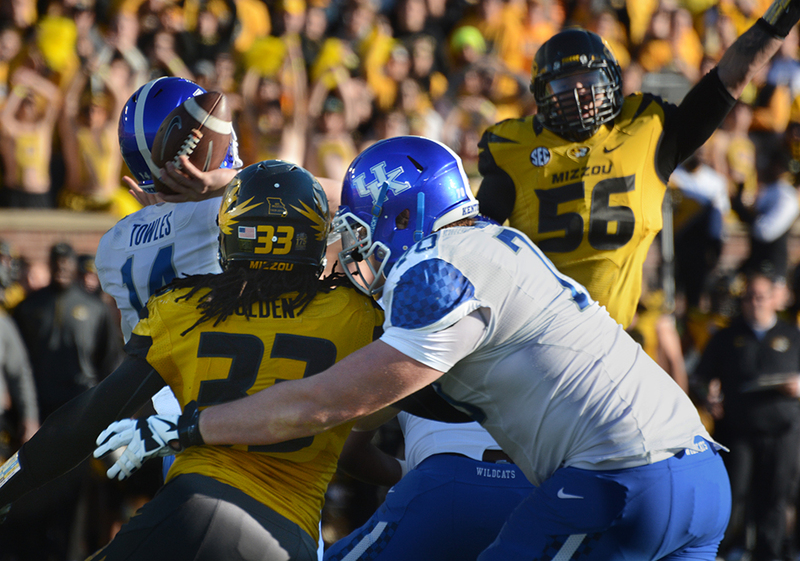 Missouri defensive end Shane Ray (56) jumps to knock down Kentucky quarterback Patrick Towles’ (14) pass at the line of scrimmage. Missouri defensive end Markus Golden (33) applies pressure to the quarterback after beating Kentucky offensive tackle Jordan Swindle (70) around the edge. 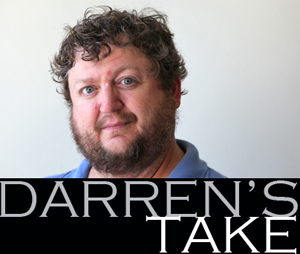 COLUMBIA — Darrian Miller didn’t stand a chance. With less than a minute remaining in the game and his team facing fourth-and-7, the Kentucky Wildcats left tackle found himself lined up against Missouri defensive end Shane Ray. Marcus Murphy honored for his historic performance vs. Florida: Every football team needs a player that can make something out of nothing. For the 2014 Missouri Tigers, that player seems to be Marcus Murphy. Murphy was honored for his playmaking ability on Monday when the Southeastern Conference named him the SEC’s special teams player of the week. It started on Saturday when the fifth-year senior returned Florida’s opening kickoff 96 yards for a touchdown. Missouri (4-2, 1-1) looks to rebound on the road against Florida (3-2, 2-2) on Saturday at Ben Hill Griffin Stadium in Gainesville. Here are four things to keep in mind before the Tigers and Gators kick off at 6 p.m. 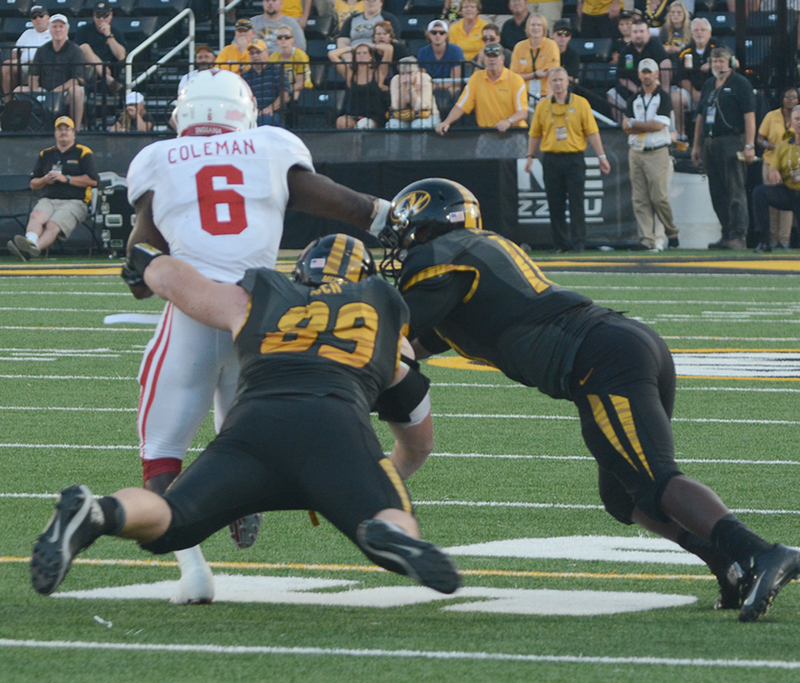 Turnover battle: It’s been over a month since Missouri forced its last turnover. The Tigers have failed to force one since defensive back Duron Singleton, 2, scooped up a fumble for a touchdown in the waning moments of the 38-10 beat down of Central Florida. The takeaway was one of five Missouri recorded on the day. 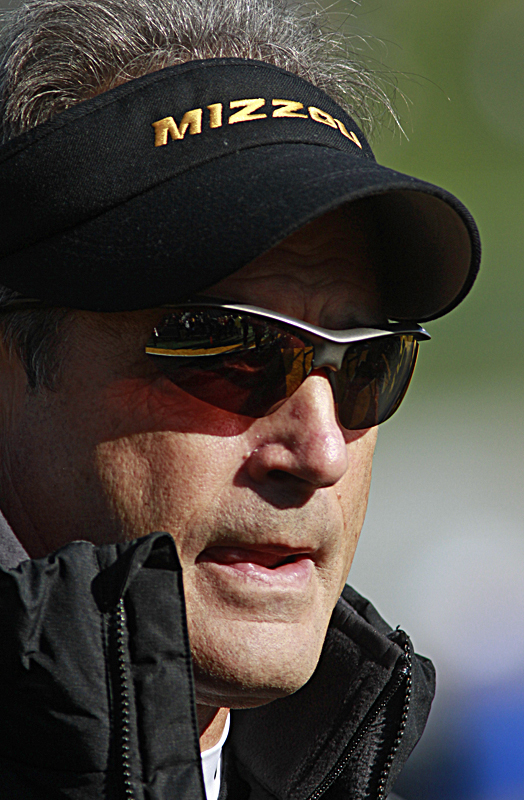 Missouri had harassed its opponents into committing a turnover in 47 consecutive games up to that point. While the defense has come up empty the last three weeks the Tigers’ offense has coughed it up six times in that span, five of which came at home last weekend against Georgia. Winning the turnover battle against a Florida team that is plus-5 in turnover margin on the year would go a long way to helping Missouri get back on track in Southeastern Conference play. Missouri defensive lineman Matt Hoch (89) and Missouri linebacker Kentrell Brothers (10) are unable to bring down Indiana running back Tevin Coleman (6) on a screen pass on Saturday, Sept. 20, 2014 at Faurot Field in Columbia, Missouri. Coleman had 19 carries for 132 yards rushing in Indiana’s 31-27 win. Indiana has the football at its 41-yard line with 1:08 left in the game. A field goal ties the game at 27. A touchdown gives Indiana the lead against the defending SEC East champion Missouri Tigers.